in cross section, a cylindrical capacitor of length L formed by two coaxial cylinders of radii a and b. 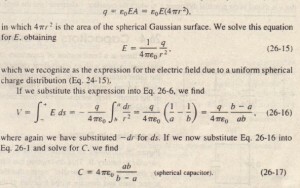 We ‘assume that L ~ b so that we can neglect the fringing of the electric field that occurs at the ends of the cylinders. each plate contains a charge of magnitude q. As a Gaussian surface, we choose a cylinder of length L and radius 1′, closed by end caps and placed as is shown in Equation 26-4 then yields . We see that the capacitance of a cylindrical capacitor, like that of a parallel-plate capacitor. depends only on geometrical factors, in this case L, b, and a. 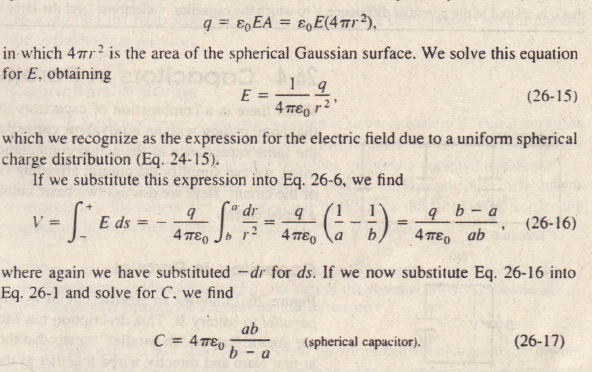 We can assign a capacitance to a single isolated spherical conductor of radius R by assuming that the “missing plate” is a conducting sphere of infinite radius. After all. the field lines that leave the surface of a positively charged isolated conductor must end somewhere; the walls of the room in which the conductor is housed can serve effectively as Oul sphere of infinite radius. When there is a combination of capacitors in a circuit, we can sometimes replace that combination with an equivalent capacitor-that is, a single capacitor that has the same capacitance as the actual combination of capacitors. With such a replacement, we can simplify the circuit, affording easier solutions for unknown quantities .of the circuit. Here we discuss two basic combinations of capacitors that allow such a replacement. When a potential difference V is applied across several capacitors connected in parcel . 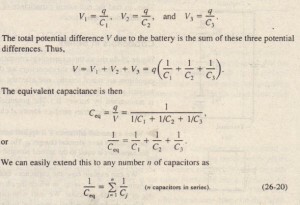 Ie!, that potential difference V is applied across each capacitor. The total charge q stored on the capacitors is the sum of the charges stored on all the capacitors. 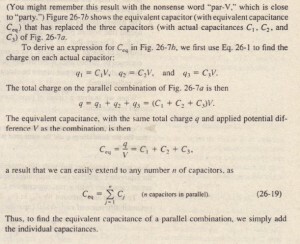 When we analyze a circuit of capacitors in parallel, we can simplify it with this mental replacemen tCapacitors connected in parallel can be replaced with an equivalent capacitor that has the same total charge q and the same potential difference V as the actual capacitors. Three capacitors connected ill series to battery B. This description has little to do with how the capacitors are drawn. Rather. “in series” means that the capacitors are wired serially. one after the other. and that a potential difference V is applied across the two ends of the series. this potential difference V is maintained by battery B.) 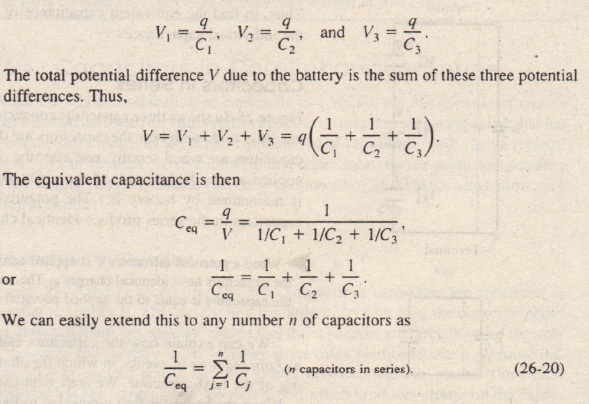 The potential differences that then exist across the capacitors in the series produce identical charges q on them. When a potential difference V is applied across several capacitors connected in series, the capacitors have identical charges q. The sum of the potential differences across all the capacitors is equal to the applied potential difference V We can explain how the capacitors end up with identical charges by following a chain reaction of events. 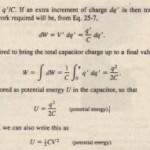 in which the charging of each capacitor causes the charging of the next capacitor. We start with capacitor 3 and work upward to capacitor I. When the battery is first connected to the series of capacitors, it produces charge = q on the bottom plate of capacitor 3. That charge then repels negative charge from the top plate of capacitor 3 (leaving it with charge +q). The repelled negative charge moves to the bottom plate of capacitor 2 (giving it charge -q). That charge on the bottom plate of capacitor 2 then repels negative charge from the top plate of capacitor 2 (leaving it with charge +q) to the bottom plate of capacitor I (giving it charge -q). Finally the charge on the bottom plate of capacitor I helps move negative.charge from the top plate of capacitor 1 to the battery, leaving that top plate with charge +q. . Here are two important points about capacitors in series. 1.can move along only one route, such as from capacitor 3 to capacitor 2 in . If there are additional routes, the capacitors are not in series. An example is given in Sample Problem 26-2. 2. The battery directly produces charges on only the two plates to which it is connected (the bottom plate of capacitor 3 and the top plate of capacitor I in Charges that are produced on the other plates are due merely to the shifting of charge already there. For example in the part of the circuit enclosed by dashed lines is electrically isolated from the rest of the circuit. Thus, the net charge of that part cannot be changed by the battery-its charge can only be redistributed. Using Eq. 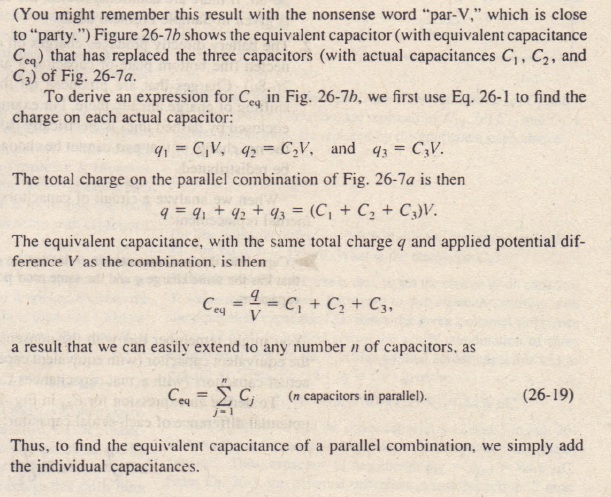 26-20 you can show that the equivalent of a series of capacitances is always less than the least capacitance in the series.